So when — oh s**t! 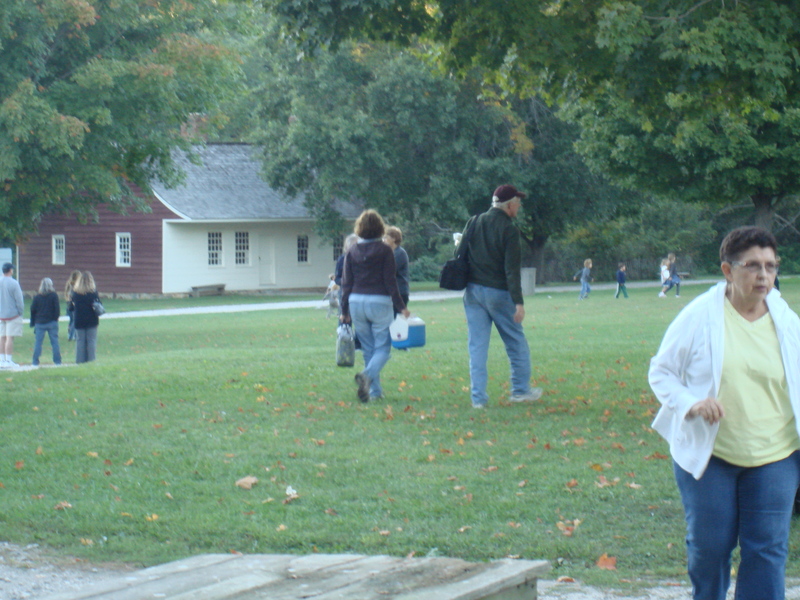 — the Restoration Farm End-of-Summer-Potluck came roaring up, I was sort of astonished, and not a little dismayed. What to make!?! You cannot go empty-handed, no matter how empty-headed you may be. And I’d already said I’d go – I vaguely remembered doing that at some strange hour in the middle of something else. And of course it’s a really good time, on the grounds of a restored old village with like-minded friends, a folksy band, and plenty of grounds for the children to run around on and not bother me while I am eating! Salvation came in the form of stuff I’d prepared and frozen just before Labor Day! Hurray for me! I defrosted pollo guisado (Puerto Rican stewed chicken), whipped up some 5-minute black beans (I actually made them from beans I had soaked, but the prep is seriously five minutes), shredded some cheese, layered it all and low and behold, I had a worthy baking dish of homemade Mexican lasagne goodness that I was not at all ashamed of. In fact, my mom thought it was the best dish on a very amply and generously laid buffet table. Okay, so she’s my mom, but she is very honest, so believe it! I give you the chicken version, but it can easily be made with Latin Seasoned Ground Beef. I ended up making pretty much the same thing, only with Flex-Mex Shredded Chicken, for a get together of The So-Called Book Club (meaning we haven’t read a book together in a year, but we still get together for drinks and conversation on occasion). 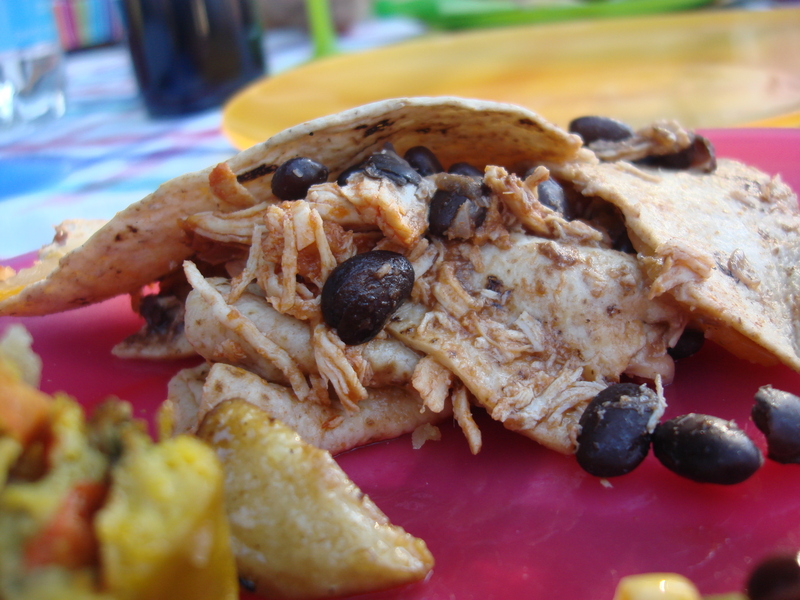 Along with Roasted Tomatillo Salsa and my now legendary Guacamole…it was a fiesta! Latin-style lasagne. Good stuff. Good party. Good night! Lightly grease a 3 qt. (8″x13″x 2″) baking dish. 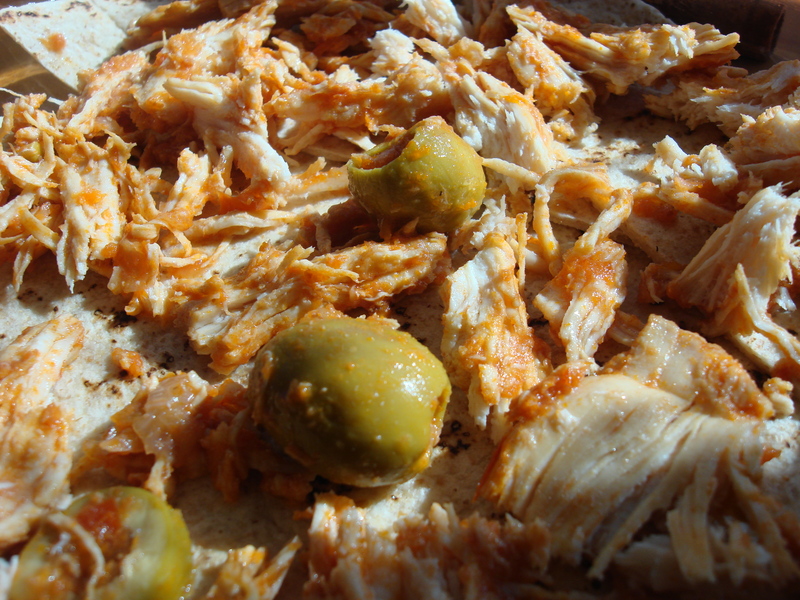 Lay down a layer of tortillas (trimming if necessary) follwoed by a layer of chicken, then beans. 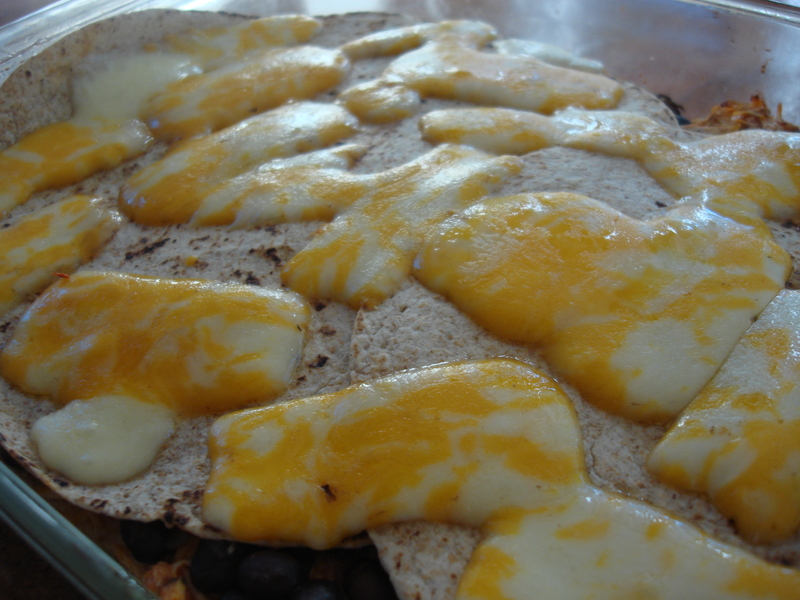 Lay down another layer of tortillas, followed by cheese, chicken, beans, tortilla, and top with cheese. If cooking with still-warm ingredients, then cook for 15 minutes under foil and an additional five minutes without foil. If cooking with pre-made ingredients from the fridge, bake for an additional ten minutes before taking off the foil. Watch the cheese for excessive browning. For complete recipes, see below. 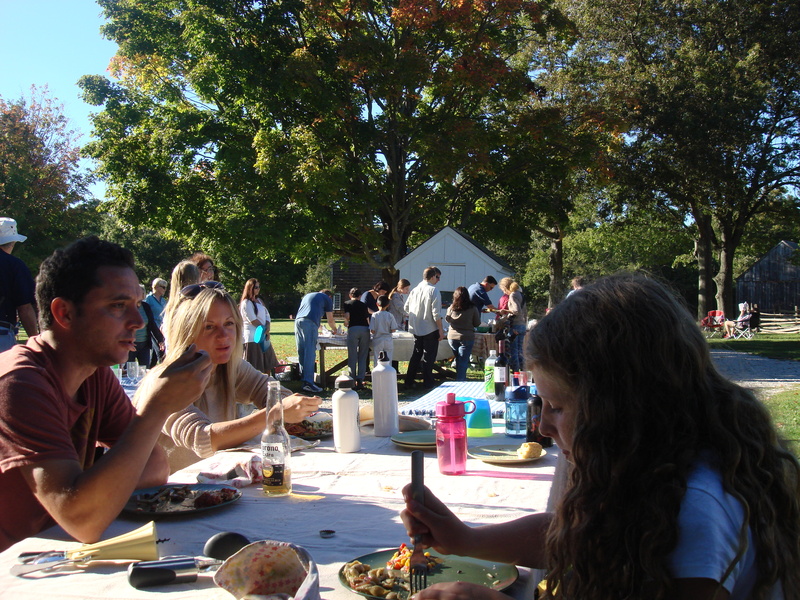 For a beautiful round-up of the potluck, visit T.W. Barritt’s blog post at Culinary Types! In a saucepan, heat oil until fragrant and liquid. Add onion, peppers and garlic, coat and lower heat, sauteing until wilted. Add tomatoes and allow to thicken at medium heat. Add chicken and stir to coat then add salt. Add wine and beer and bring to boil, simmer 15 minutes and then add stuffed olives. Simmer another 15-20 minutes to let the flavors develop and the chicken to tenderize. I let it cook as long as I have time for so the chicken begins to fall apart. Serve over rice or as part of a quesadilla or over tortillas with melted cheese. Serves four big appetites. Or divide up into four freezeable portions and defrost as needed. This was indeed a delicious addition to the buffet table! And the pot luck was great fun – I can’t believe the season is almost concluded. Thanks T.W.! I hope next year we have more time to spend on the farm…it was a wonderful season; let’s not lose touch over the winter! I would love to hear about it when you try it! Thanks! Don’t blink or it will be Christmas! Oh God, I am not prepared to plan Christmas dinner yet…pleeeeeez don’t get my wheels spinning!